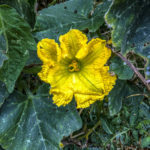 This morning I saw a squash blossom trumpeting its way through the tangled leaves of our Random Garden. Sigh. A precious female bloom, but too late. It’s October 26. Even though we enjoy a mild winter in this part of Portugal, we know there’s not sun enough now to ripen those fruits that still spring forth from what was, in April, a pile of compost spread into bamboo beds. 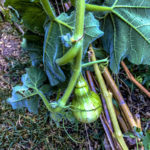 Still, she’s a pretty picture… We failed to have a squash ripen all summer and autumn long. 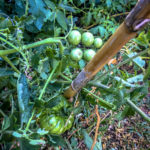 But it’s been a marvelous year for the tomatoes. We reckon we’ve harvested more than 20 pounds, easily 10 kg, and they’ve turned out to run the gamut of flavor, between the sweetest ones of August, smelling almost of basil, to the more tart ones we’ve harvested through this very morning. They come pre-salted, basted by the sea breezes and the inevitable salinity of the sand-soil beneath us. 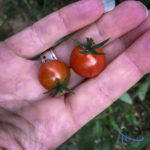 They grew into a single massive bush of both coração and cherry toms, of all different sizes yet woven together. 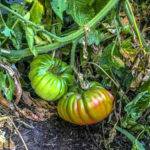 Sometimes during late summer we’d dive into the corner mound of green, having seen a flash of red, and surface holding a glowing orb, smelling of tomato leaves—a glorious fragrance I would bottle and wear. 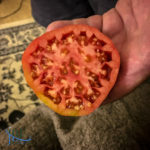 A classic coração tomato local to this part of Portugal. This exact part. We’ve had competition for our bounty, however. 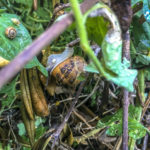 For some reason, this year has been epic for snails, the caracois we see promoted on menus around the region. We could harvest a feast, if we were so moved. 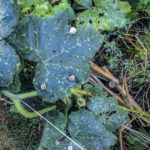 They’ve taken over now, beginning the decomposition of autumn, attaching themselves to leaves and fruit alike, feasting on the tomatoes we fail to find in the thicket. 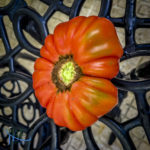 Some are grand, suitable for a plate of escargots de bourgoigne, and most are small, some no larger than a grain of rice. I went to hang laundry one day, and as a I snapped a clothespin from the line I heard a crackle and a crunch. Oh. Sorry. Several had nested themselves inside the wooden clothespins, feeding on what there I don’t know. The Grande Snail, clearly well fed. Ahem. For a while I tried flinging them over the wall after pulling them off my tomato plants, giving them the joy of flight before their presumed demise. But it was a thankless, fruitless project. We haven’t investigated another organic means of dissuading them from our patch. They climb the exterior walls of every house on our street. We even had one traverse our office ceiling. For a couple of days I just tracked its progress, curious as to where it might go. Eventually, it dried up and dropped onto the floor. Sigh, again. 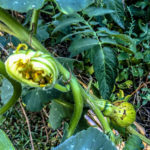 As we come into the denouement of the Random Garden for the season, we look back to the forests for more bounty to come soon. 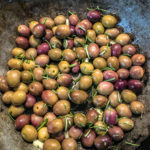 And throughout Portugal—and Spain, France, Italy—November brings us the onset of the olive harvest. 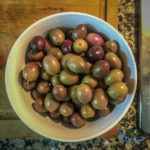 To prepare for it, I’m working through my preserved olives from last year, and have two quick recipes that make the most of what’s left in the jars. The first, sautéed olives, inspired by those made at a friend’s restaurant when we first moved to town. I varied mine to add Aleppo pepper, but smoked paprika or red pepper flakes could easily substitute in if you don’t have the Aleppo on hand. 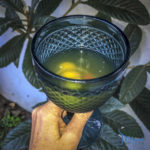 The second, a bit of fun—being a fan of the dirty martini, I brined olives (these were pre-stuffed with anchovies, but you could use any pitted olive) with preserved lemon finely diced, a bit of its juice, thinly sliced onions, and a sliced piri-piri pepper (or bird’s eye chile). 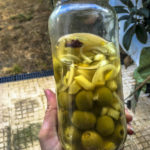 Once I’d consumed most of the olives, an ounce and a half of the brine matched with an ounce and a half of vodka (and olives and onion for garnish, of course) made an excellent finish to the jar. You could also sub in a London dry gin for the vodka if you wanted. 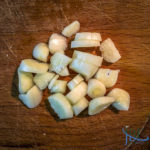 Heat the garlic slowly in the olive oil (use about 2 tablespoons, to your taste) in a medium sauté pan over medium-low heat for about 3 minutes, until beginning to turn golden. 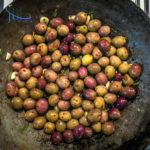 Toss in the olives and coat them with the oil in the sauté pan. Heat for 2-3 more minutes. 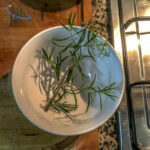 Add the minced rosemary (I snip it over the pan with kitchen scissors). Toss well to combine. Add the pepper. Toss a final time. Let warm in the pan for another 2-3 minutes, then turn off the heat. Eat while warm! 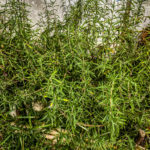 The rosemary bush should thrive well into the winter…check back on the next installment of the Random Garden, in January.